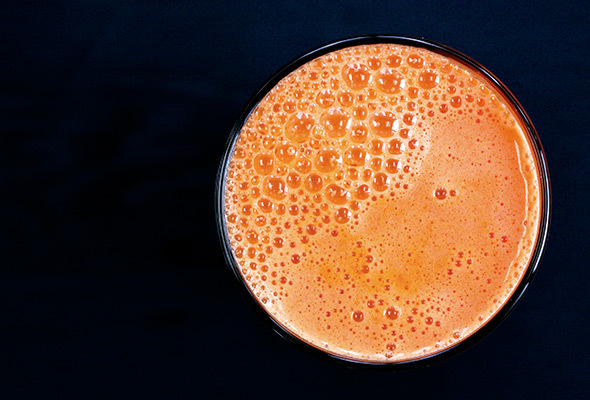 What makes this carrot apple juice recipe work, in our opinion, is the intriguing interplay between tart and sweet. To ramp up its pucker power, we relied not just on lime but on tart green apples instead of the more dulcet red ones. But that’s us. Do as you please. 1. Put everything through your juicer, 1 ingredient at a time. Sip or slurp the carrot apple juice to your heart’s content. Does a recipe count as a detox if you're performing the cleanse before the storm? In preparation for the approaching holidays (and retribution for consuming as many edible gifts I'd intended to give to others as I was actually setting aside), I tried this quick and simple carrot apple juice recipe. I thought it’d be too tart, but it wasn’t. I also thought the absence of a juicer might ruin this, but it didn’t. I was able to prepare the recipe with a food processor and a few extra minutes of blending. The result was more smoothie-like than juice-like—hence, per my preference, I ended up adding a bit of water to thin it out and make it more of a pulpy juice instead, though that wasn’t necessary. I also added a small chunk of ginger I had on hand. The juice was potent, refreshing, and substantial, and as far as buying produce in the winter goes, this recipe is not the worst offender. This carrot apple juice recipe is a wonderful combination of earthy and bright, tart and sweet (depending on which apple you choose—I went for the tart Granny as red apples were not so happy looking). The carrots are so sweet. The carrot apple juice is 100% fantastic and healthy. I think this recipe is wonderful on its own, but it would also make a great springboard for other combinations (think cilantro and basil). The world of detox is yours! 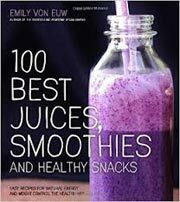 Carrot Apple Juice Recipe © 2014 Emily von Euw. Photo © 2014 Emily von Euw. All rights reserved. All recipes and photos used with permission of the publisher.